Settlement of land in the vicinity of the McDonald Farm began in the 1830s. However, the land was owned by the Federal government and could not be legally acquired by individuals until sale had been authorized by Congress and the property had been surveyed. Action by Congress and survey work was not completed until the early 1840s. At that time, two individuals who had previously "claimed" the property deeded it to Jonathon Royce. The farm did well in the following decades. 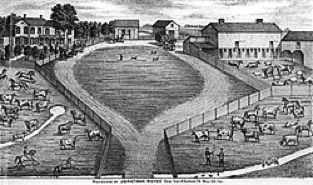 A drawing of the farm in the 1873 "Will County Atlas" presented a picture of agricultural prosperity. There were substantial and well maintained barns and other buildings. The fields were full of cattle, sheep and horses. There was an orchard. And there was a very large house--we have been told that it contained 23 rooms when it burned down in the 1920s. 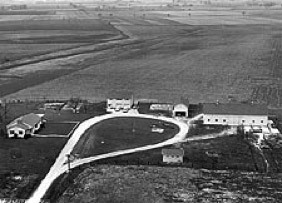 The Royce Family continued to own the farm until about 1926. At that time the property was sold to John Miller, an immigrant from Serbia. The Miller family managed to make loan payments and were able to hold on to the farm during the Depression. Plenty of hands were available to help with the farming chores--there were 14 Miller children. Over the years a few of them have visited us and shared memories of growing up here. The Miller's sold the farm in the early 1940s to an individual who purchased it as an investment. Sterling and Lenore McDonald purchased the farm in 1949. The McDonald's set out in 1949 to rejuvenate a property that had fallen on hard times. The huge Royce farmhouse that had burned in the 1920s had been replaced by a much more modest house. The major part of that house had been removed from the property. The McDonald's built a new ranch-style house on the site where the previous houses had stood. This house must have been the talk of the neighborhood--it had a dishwasher! You’ll see the same dishwasher in our office kitchen today, and it still works. The McDonald's also rehabilitated the barns and other buildings. Lenore McDonald continued to live on the farm after her husband Sterling's death in 1966. By the late 1970s the neighborhood was changing dramatically. Farms were disappearing and being replacing with subdivisions. In less than ten years, what had been farms as far as the eye could see were now houses. The McDonald Farm was the only holdout. Ever stubborn, Lenore continued operating the farm as she had always done. But her task increasingly became one of holding out against the encroachment of suburbia. 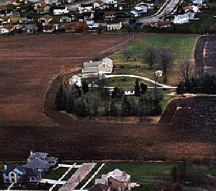 The City of Naperville dried up ponds on the property, cut trees to widen Knoch Knolls Road, and built sewer and stormwater lines across the property. It became difficult to move farm equipment on busy suburban streets. Streets in the adjoining subdivisions were paved right up to the property line. Everything seemed to be pointing to a not very distant day when the McDonald Farm would be just another subdivision. Sometimes greeting them with shotgun in hand, Lenore turned away the developers who stopped by to offer more and more money for the property. Even though the temptation must have been great to take the money and move beyond the reach of suburbia, she had decided that no one was going to build houses on her farm. In order to ensure that her wish would be honored, Lenore gave her farm to The Conservation Foundation in 1992. Her donation specified that the property must be kept in conservation, education, and agricultural uses. Lenore retained a life estate, giving her full use of the property until her death or until she chose to relinquish the life estate. She did the latter in late 1997, passing full control of McDonald Farm to The Conservation Foundation. The Conservation Foundation’s offices moved to McDonald Farm in the spring of 1998. Since then we have been working hard to maintain and improve the property and use it to further the causes of conservation, education and agriculture in accordance with Lenore’s wishes.